A major sub-theme of the US Coin Values Advisor site is to put in plain words the connection between the history of the United States and its coinage. Both influence and react to the other. I believe that in order to reap the full benefits of collecting, one must have an understanding of the historical significance of their coins. Let's look at seven examples of the coins/history relationship. I could've come up with a lot more, but these more or less randomly pulled off the top of my head. 1793 was the first year the United States Mint struck the one cent coin. In the 222 years since then, the lowly cent has been minted every single year, with the sole exception of 1815. The War of 1812 against Great Britain and the prelude leading up to the conflict were responsible for this anomaly. The Mint had been purchasing copper planchets from the British firm of Boulton, Watt & Company since the 1790's for coining into half cents and cents. As relations between the United States and Great Britain worsened, planchet hauls from Britain were interrupted in January 1811. The Mint stopped making half cents altogether, but continued to issue a decreasing quantity of cents until 1814, when production ceased. 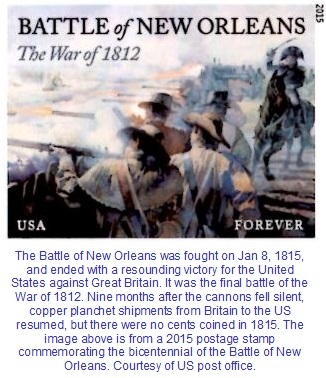 In September 1815, nine months after the final battle in the war was fought, planchet shipments resumed, but it wasn't until the following year, 1816, that cents were struck once again, missing coinage in 1815 completely. So, the US one cent coin is 221 out of 222 in terms of consistency, by far the best of any United States coin denomination. Gold was discovered near Coloma, California in January 1848. Word spread quickly, and by 1849, many thousands of "49'ers" were on their way to the west coast gold fields in search of riches. A shipment of 228 ounces of California gold ended up at the Philadelphia Mint with special instructions: issue coins using this gold and bearing a distinctive mark to indicate the origin of the metal. A special counter stamp was made to impart the lettering "CAL." to 1,389 Quarter Eagles ($2.50 face value) dated 1848. Genuine examples of the 1848 "CAL." Quarter Eagle show no damage on the obverse (i.e. Heads side), a sure sign the counter stamp was punched before the coin was removed from the die. Ordinary 1848 Quarter Eagles altered to mimic the "CAL." variety will show damage on the obverse as a result of force applied to the reverse to stamp the fraudulent lettering. 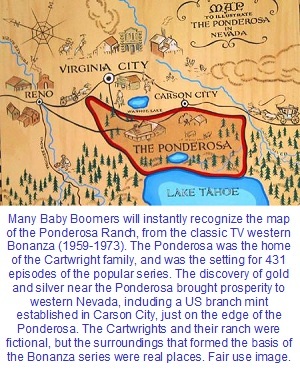 The California Gold Rush proved to be a transformative event in the settling of the American West. Since the colonial times, America had an East Coast, but now, it also had a West Coast. Ever since its issuance, collectors have eagerly sought to own an 1848 "CAL." Quarter Eagle, a literal piece of history. The 1848 CAL. Quarter Eagle is one of the coins tracked in our Rare Coin Values Index. The American Civil War entered its fourth year in 1864, with no end in sight. As the bloody conflict continued to exact its toll, more and more prayers were sent to heaven in search of help from the Lord Almighty. 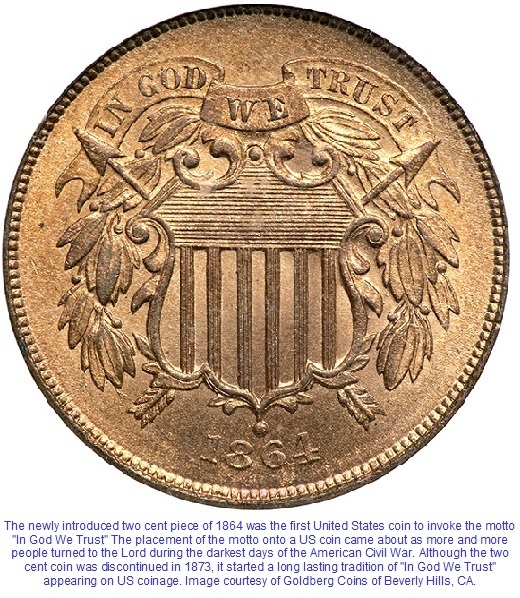 Reacting to the religious sentiment sweeping the nation, the newly authorized two cent coin of 1864 bore the motto "In God We Trust", marking the first time the Lord's name was placed on United States coinage. The reference to God on the 1864 Two Cent coin began a longstanding tradition in American coinage, though it wasn't until the 1950's that the placement of the motto was codified into law. Imagine the howling of the anti-religious zealots in control of our culture today if someone for the first time attempted to invoke God's name on a US coin. It could never happen in modern day America. A coinage act passed by Congress and signed into law by President Ulysses Grant on February 12, 1873 inadvertently ignited a chain reaction of events that plunged the United States into one of the most severe economic depressions in its history. Among other things, the law put an end to silver purchases by the government, leading to a reduction in the money supply and causing interest rates to rise, felt painfully by borrowers while raising widespread doubts about the future health of the economy. The gloomy outlook dissuaded investors from purchasing long term bonds. In this environment, Jay Cooke & Company, one the largest and most influential private investment banks at the time, was unable to sell bonds to finance the nation's second transcontinental railroad, and was forced to file bankruptcy in September. 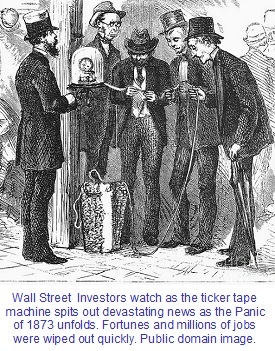 Other banks quickly collapsed, followed by business closures and millions of lost jobs, setting off the "Panic of 1873". It wasn't until 1879 before economic conditions began to improve. On May 5, 1893, the New York Stock Exchange suddenly plunged in dramatic fashion, sparking another serious economic depression in the United States. Even before the downturn, the branch mint in Carson City, NV had been slowing down. Low silver prices and falling production from depleted Nevada silver mines diminished the role of the Carson City Mint. Furthermore, scandalous actions by a few employees tarnished the mint's already less than stellar reputation. Few were surprised when on June 1, 1893, Director Robert Preston ordered a cessation of coining operations at Carson City, but kept its doors open as an assay office. Conventional wisdom was that the shut down would be temporary; once business conditions improved, the coining presses would be fired up again. That never happened, as there were to be no more "CC" coins ever. R.I.P. Carson City Mint (1869-1893). World War I erupted in Europe in 1914. The United States remained officially neutral on the sidelines for the first few years of the war, nervously hoping its allies would emerge victorious. 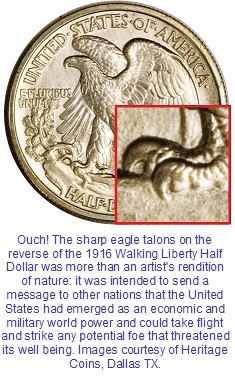 In 1916, three new US coins were released into circulation: the Mercury Dime, the Standing Liberty Quarter, and the Walking Liberty Half Dollar. The designer of the half dollar (as well as the dime), Adolph A. Weinman, selected a deeply patriotic theme. The obverse depicted Lady Liberty draped in the stars and stripes, marching toward the sunrise. The reverse was dominated by a powerful eagle poised for flight, with fearsome talons ready for action. Weinman's design was widely acclaimed for its majestic beauty, but the imagery was also intended to be a warning to any potential adversaries: the United States had matured into a world power and could respond with devastating force if provoked. The United States entered World War I on April 6, 1917. Soon, Germany and the other members of the Central Powers experienced first hand that Weinman's depiction of America's might was more than just a theory. As American "doughboys" and armaments arrived on the scene, the balance of power tilted solidly in favor of the Allies. On November 11, 1918, what was then up to that point in time the costliest war in human history, came to an end. The United States formally entered World War II in December, 1941. As the nation mobilized for war, more and more copper was needed for ammunition and other military purposes. Copper that would have been used to make the 1943 Lincoln Cents was diverted to the war effort. In its place was a cent composed of steel with a zinc coat. The steel pennies were magnetic and weighed 13% less than the copper cent. The "steelies" did not perform as well as hoped. Because they could be picked up with a magnetic, they did not work in vending machines. They also rusted easily. Mint officials realized they needed to come up with a better plan in time for the 1944 cents. 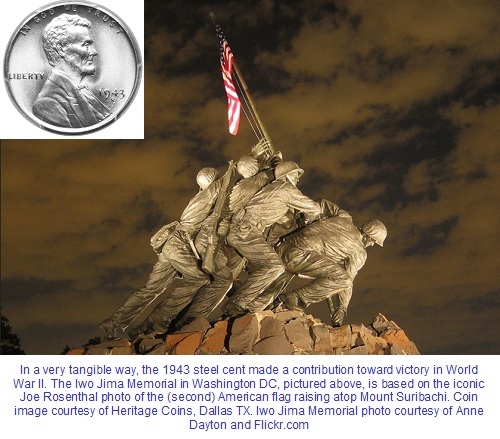 More than one billion 1943 steel cents were struck. A better plan was indeed developed. Spent shell casings were salvaged from the battlefronts overseas and recycled into pennies. The alloy wasn't quite the same as the pre-war composition, but close enough. The recycled casing copper cents were produced by the billions in 1944, 1945, and 1946. The pre-war composition resumed in 1947. Many thanks go to Anne Dayton for making the beautiful photo below available on Flickr. These are but a few examples of how United States coins reflect history as well as shape the future. Seems as if I picked mostly examples related to wartime events here, but there are plenty more stories to tell. If you would like to make a contribution to this topic, I invite you to use our feedback form.